Labour Party MP John Mann vows to fight anti-Semitism in the UK, including traditional hate and hate from the Left, Muslim community. 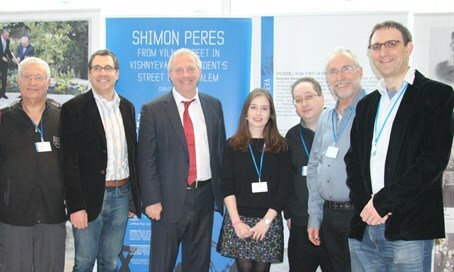 Chairman of the All Party Parliamentary Group Against Anti-Semitism in the British parliament and Labour Party member John Mann spoke at the British Limmud Conference Monday, addressing the issue of rising anti-Semitism in the UK and Europe to 3,000 young Jews. Skyrocketing anti-Semitism in Britain "is a dangerous situation and very volatile, with very serious potential consequences," he said. Mann addressed "three forms of anti-Semitism: Traditional anti-Semitism, anti-Semitism of the left and anti-Semitism from the Muslim community" - and vowed to fight them. He also addressed a series of anti-Semitic remarks from Labour Party MP Gerald Kaufman, who accused Jews of using "Jewish money" to bribe the Conservative Party and also claimed that Israel is "fabricating" Palestinian terror attacks against Jews. Mann vehemently condemned Kaufman as “a disgrace to parliament, a disgrace to the Labour Party and it’s a disgrace he is called the Father of the House." He vowed to speak with Labour Party chair Jeremy Corbyn over the issue. Mann also visited the From Wisniew in Vilna to President St. in Jerusalem exhibit in Birmingham, which marks the achievements of former President Shimon Peres, and which was the fruit of efforts from Limmud FSU's Chaim Chesler. During the visit, Mann spoke with Chesler and curator of the exhibition, Yoram Dori, who told Mann the story of Peres's grandfather, Zvi Meltzer, who was murdered in the Holocaust along with another 2,500 Jews during prayers in the synagogue. Mann, who met with Peres during his visit to Israel, expressed shock over his story and said he would do everything he could in his capacity to "eradicate the effects of any kind of violence against the Jews of Britain and Europe in general."